Guwahati gears up to host the 3rd Brahmaputra Literary Festival 2019 with a three-day long programme begining on February 9. According to information, entry will be free for the literary festival to be organised at Srimanta Sankardev Kalakshetra in Guwahati. The festival, organised by Publication Board Assam and supported by the Assam government, is aimed at promoting the habit of reading amongst the youth. More than eight thousand people are expected to be present in the event. The programme includes literary session, felicitations and cultural programme. An organising team has already been formed with V. B. Pyarelal, chairman of Assam Administrative Tribunal and Assam Board of Revenue, as the advisor; Maninder Singh as the chairman; Pramod Kalita, secretary of Publication Board Assam, as the CEO and Rahul Jain, who has straddled the world of media since 2001, as artistic director. The Brahmaputra Literary Festival not only proposes to focus on different languages, literatures, culture, society, politics, performance traditions, music, identity, media of the northeastern region but also national and international elements packaged in the three-day event. The festival brings together prominent personalities, celebrities, writers, thinkers, artists and other performers both from the Northeast and across the country as well as internationally acknowledged litterateurs and other intellectuals. It is expected that the get-together will encourage new ideas and their dissemination, and create an atmosphere of enthusiasm and offer a platform for intellectual exchanges. Among the speakers include HS Shivaprakash, Professor, Theatre and Performance Studies, JNU, and author of 9 books of poems, 15 plays and 3 critical works in Kannada; Dr. Landup Dorjee, who has authored ‘Ladakhi Sheeraza’; Shrayana Bhattacharya, an economist doing research on social policy and labour; Dr. Md. Meraj Ahmad, Sr. Assistant Professor, Department of Sanskrit University of Kashmir, Srinagar; Teesta Guha Sarkar, senior commissioning editor at Pan Macmillan India; PraCh Ly, a Cambodian-American rapper from Long Beach in California; Ashutosh Agnihotri, an IAS officer serving in Assam, who is also a poet and author of three books and many others. 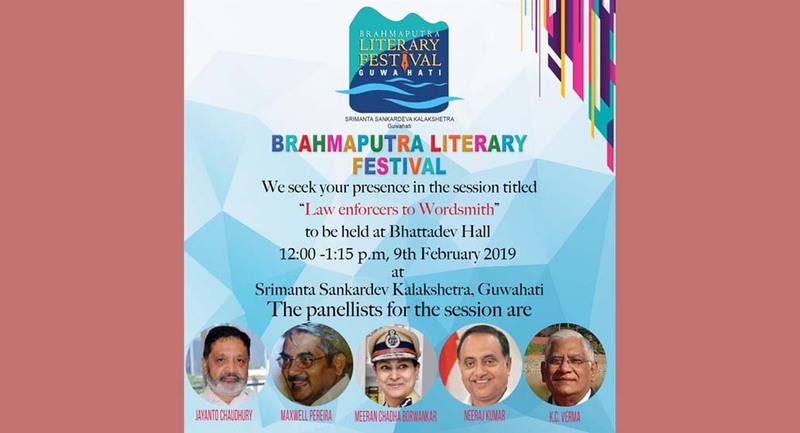 The session, titled ‘Law enforces to Wordsmith’ to be held at Bhattadev Hall of Srimanta Sankardev Kalakshetra on February 9, 2019,from 12 noon to 1.15 pm, will have Jayanto Chaudhury, Maxwell Pereira, Meera Chadha Borwankar, Neeraj Kumar and KK Verma as the panellists.